Marcos Giron's Tennis Racquet - What racquet does Marcos Giron use? 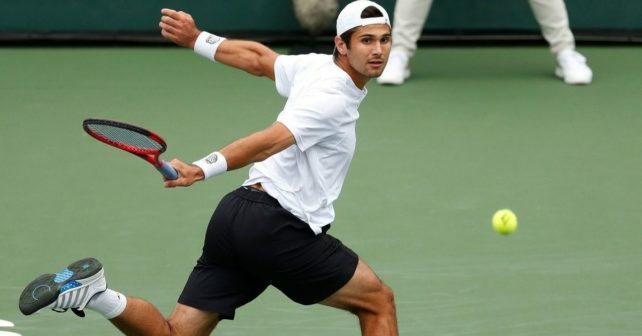 Marcos Giron is a 25-year-old American tennis player that few had heard about before his run in Indian Wells. After qualifying, he managed to beat Chardy and De Minaur before falling to Raonic in the third round. So you tennis nerds obviously wonder: what is Marcos Giron’s tennis racquet? In Marcos Giron’s case, he actually plays with what your eyes and his paint job tell you, the Yonex VCORE 95. According to the Tennis Warehouse staff, they help with the customization of his racquet, but as of yet, it is not known what exact specs he uses for his setup. The Tennis Warehouse forum thread is here if you want to check that out. Giron uses a, for now, unknown string and wears Kswiss tennis apparel. It will be interesting to see how he can follow up the positive results from Indian Wells during the rest of 2019. If you are interested in Marcos Giron’s tennis racquet, the Yonex VCORE 95, I reviewed it here. It is a more powerful 95 sq inch racquet that plays like a slightly bigger head size thanks to the Yonex Isometric head shape. It doesn’t have the pinpoint control of an old HEAD Prestige or Pro Tour, but it is a bit easier to use and gives you a bit more spin and pop for free. I really liked this racquet when I played with it and I think it can fit players who are more used to a 98 sq inch head size but just want a faster feel. Denis Shapovalov also plays with a version of this racquet and Stan Wawrinka plays with the Yonex VCORE 95D which shares some similarities, so the 95 sq inch racquet is definitely alive and kicking. Below you will find my Yonex VCORE 95 video review. I used it strung with Solinco Hyper-G, one of my go-to testing strings. Have you tried the Yonex VCORE 95? What did you think of it? Please comment below.